On one of the most successful Day of Champions ever, the MotoGP paddock and thousands of fans came together to support the African relief organization Riders for Health, and the highlight of the day was the annual MotoGP memorabilia auction. Fans gathered in front of the stage to get up close to their favorite MotoGP stars and bid on signed personal racing memorabilia, once-in-a-lifetime experiences and unique paintings. In total, 108 items were sold to raise money for the lifesaving work of Riders for Health – the official charity of MotoGP – bringing the total amount raised at Day of Champions to an astonishing €253,562 (about $337,000 US), which will help Riders for Health use reliable motorcycles to reach 14 million people in Africa. The auction was hosted by Riders for Health co-founder and racing legend Randy Mamola, Eurosport duo Julian Ryder and Toby Moody, MotoGP commentator Gavin Emmett and BBC MotoGP presenter Matt Roberts. The item that raised the most during the auction was a Bridgestone racing tyre signed by all of the MotoGP riders who came up on stage, which brought about $7,217 US. 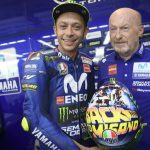 Nine-time World Champion Valentino Rossi raised an incredible $20,788 while on stage, auctioning items including the cap from his head which raised £1,000 ($1,569) and some knee-sliders he produced from his pocket. Before Rossi left stage, Riders for Health announced that over the last 10 years, Valentino and his fans have raised nearly $400,000 to support Riders for Health’s work in Africa. The most popular item of signed memorabilia from a single rider was a set of framed elbow sliders donated by Moto2 World Champion and current MotoGP championship leader, Marc Marquez. The hardest working elbow sliders in MotoGP raised £3,800 and, in total, Marc raised almost $17,000 US. Jorge Lorenzo raised £3,700 by helping to auction a set of MotoGP grid passes, as well as a team shirt and original signed artwork. Fellow championship contender, Dani Pedrosa auctioned a pair of boots for £750 and raised £1,650 in total. Nicky Hayden was one of the most popular riders of the evening, as he helped raise £8,550 ($13,440) while on stage. As well as items from riders, fans donated thousands of pounds for a series of MotoGP VIP experiences. Team hospitality packages, grid passes for Sunday, track days, F1 factory tours and the chance to shadow MotoGP photographer Andrew Northcott were all auctioned. Earlier in the day, a competition to win a VIP MotoGP weekend to Valencia was launched on stage with a special video featuring some of the stars of MotoGP. The competition is open globally until October 14. 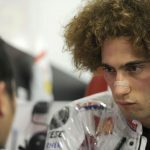 To enter, make a donation of as little as a €3/$3 to Riders for Health at www.prizeo.com/motogp. All of the money raised at Day of Champions will enable Riders for Health to get more health workers on the road in Africa so that they can reach people in remote rural communities with vital health care. Riders for Health provides health workers with motorcycles and trains them to ride safely over the rugged terrain, and to do daily checks on their motorcycle so that it doesn’t break down and leave vulnerable families isolated. Riders for Health is an international non-profit enterprise that manages and maintains vehicles for health-focused partners in sub-Saharan Africa. Its vehicles, mostly motorcycles and ambulances, serve 12 million people in seven countries, enabling health workers to deliver vital health care to rural communities. Learn more at www.Riders.org.